There have been some grumblings from a number of theatre-goers recently in relation to ‘safe’ casting, in which certain productions are repeatedly returning to the same actors. I understand their point. As brilliant as these established performers may be, the joy of theatre is that you are able to experience a new interpretation of a familiar role with every new actor who takes it on. Seeing the same people revisit a role again and again can sometimes make a show feel stale. It looks like theatre-goers are starting to get what they want though. At the 25th anniversary production of The Phantom of the Opera, Swedish actor Peter Joback was introduced to audiences in the finale, singing alongside definitive Phantom’s Colm Wilkinson, John Owen-Jones, Antony Warlow and, of course, Ramin Karimloo. It was announced shortly after that Joback is set to take over the lead role of The Phantom in the West End production at Her Majesty’s Theatre in March 2012. Phantom fans have met the news with mixed feelings. While I think it’s a great move to cast a relatively new (to the West End anyway) actor in the wake of its twenty-fifth celebrations, I’m not sure yet as to whether his voice is suited to the role. I was left underwhelmed at the 25th anniversary production, but that was only a brief snippet of course – not liking to critique someone before I’ve seen them for myself, I’ll reserve judgement until March. I do hope he does well here though. Breaking audiences out of this comfort blanket of familiarity they seem to have wrapped themselves in is something that must be addressed if the West End is to move forward, instead of stagnating. If it turns out that Joback isn’t the man to help do this, I’m very confident that Geronimo Rauch is. It can be announced today that Rauch, who is currently playing the role of Jean Valjean in the Barcelona production of Les Miserables, will take over the same role at the Queen’s Theatre in London’s West End from 18th June 2012. Originating from Argentina, Rauch is no stranger to the Schonberg and Boublil musical: it was where he began his musical theatre career in 2000, covering the roles of Feuilly, Marius and Enjolras in The Opera Theatre, Buenos Aires. Following that, he managed to secure a role in another BA production, this time playing Doody in Grease. His singing talents were appreciated in wider circles than just musical theatre however. In earlier years, Rauch was a member of the group Voxpop, which performed Queen songs a capella and in 2002, he entered the TV talent show Popstars which was looking to find five singers to create a new band. Rauch was one of the five singers selected, becoming a member of the band Mambru. They were pretty successful for a few years (the first album went triple-platinum) but went their separate ways in 2005. After a string of solo projects, Rauch returned to the stage in 2007 for an amateur production of Jesus Christ Superstar in Argentina, playing the title role. From there, he went on to join the cast of Rent in Buenos Aires and it was during his run there that he was called up to play the role of Jesus again, this time in a professional production of JCS at the Teatro Lope de Vega in Madrid. The musical toured around Spain in 2009 and it was in that year that Rauch was nominated for the Best Actor award in The Musical Theatre Awards (previously named Premios Gran Via). After his acclaimed stint in JCS, Rauch moved on to Chicago at Madrid’s Coliseum Theatre, where he played the gender-reversed role of Mary Sunshine. His performance earned him another MTA nomination; for Best Supporting Actor this time. Rauch came full circle in 2010 when he found himself back at Les Miserables, this time on the more prominent stage of the Theatre Lope de Vega where he’d already been so well-received in JCS. Instead of being an understudy, as he had been back in 2000, Rauch was now leading the musical as ex-convict Jean Valjean. Receiving rave reviews, Rauch has become something of a sensation in Madrid. He was invited to the 25th Anniversary Concert of Les Miserables at the O2 in London as part of their celebrations and last year, resumed his role as Valjean in the premiere of Barcelona’s production of Les Miserables. He is also one fourth of Poker de Voces, a power-house group of voices comprised of Rauch, Daniel Diges, David Ordinas and Ignasi Vidal. They performed a recent concert in Madrid, singing everything from opera to rock n’ roll and musical theatre. So now, after pretty much conquering the theatre world over there, Rauch is heading across the sea to continue his success in London’s West End – I couldn’t be more pleased. I’ve followed Rauch for a while now and remain in awe at the range and purity of his voice. He is a phenomenal talent and I have no doubt that he is going to be a breath of fresh air for the West End. This is something he has been working toward for some time and I know how thrilled he is to have this opportunity – London’s theatre-goers should be too. Range and purity? Sounds good! Look forward to seeing this new interpretation of Valjean. Great article, Gero definitelly deserves opinions like yours. Just one correction though (or addition if you’d like), Gerónimo WAS one fourth of Poker de Voces, he left it for pursuing another field of music: to study opera singing. And his recent debut as an opera singer was more than well accepted by public. Hi. 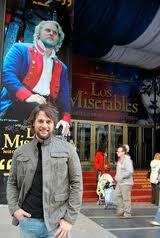 Do you know who will replace Ramin as Valjean?